The album art pretty much says it all on this one. North by North is really great at building that creepy, off-kilter atmosphere pioneered by the Pixies. But instead of minimalism, they go in quite the opposite direction. Fans of Panic at the Disco, Cold War Kids, and Muddy Waters: rejoice. You have something you all can like together. 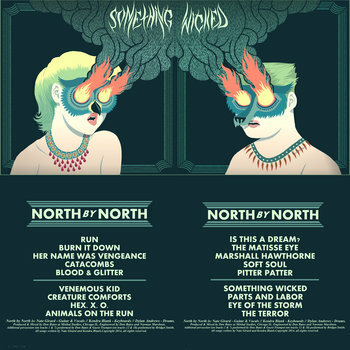 Something Wicked, an epic double-album by this Chicago-based blues-goth band, is a tour de force of buzzing guitars, soaring keyboards, and impassioned vocals. This is one for the books: an impressive show of originality and derring-do.